As of June 2012 – A new mid week Wednesday training hall has started; here we work on more advanced combat ranging from singular combat to unit fighting. 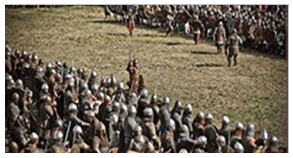 Only those who have been passed by a Joms Viking training officer or have gone through the JomsViking fighting system basic training may fight on Wednesday’s. We look forward to seeing you there!